Welcome to the third in a four-part series that will provide real-world advice about portable PA systems, co-presented by Yamaha and Performer Magazine. In this installment, we’ll take a closer look controlling feedback, and setting up a portable PA system for house concerts and other non-traditional venues (such as coffeehouses, church halls, smaller events, etc.). Before we begin, let’s define house concerts for those who may be unfamiliar; house concerts are, as the name implies, live performances typically booked at a residential dwelling. Now, if you haven’t been hip to the house concert scene before, there are lots of benefits. House concerts typically pay (both in terms of financial compensation and oftentimes meals/lodging), they can be promoted easily by the host to a wide network of friends and potential attendees, they offer a great opportunity to sell merchandise to a captive audience, and afford performers the ability to “fill in” off-dates on the road during larger tours. The only downside, however, is that they rarely come with their own sound system, which is where the portable PA system fits in perfectly. We’ve come to know many artists over the years who continually book (and make a living off) house concert tours with nothing more than a vehicle, a guitar, and a portable PA system. SO, DO YOU REALLY NEED A PORTABLE PA FOR HOUSE CONCERTS? In short, yes. We’ve had first-hand experience attending such events without the benefit of PA systems, and the results have been less-than-ideal. For starters, house concerts typically appeal to acoustic-based singer/songwriters and solo artists, which means that without a full, amplified band, it might be difficult to hear the performance optimally (or the overall sound might be a tad thin) if it’s entirely acoustic with no vocal mics or instrument amplification. You may start out booking house concerts thinking that just an acoustic guitar and your voice will be enough to fill a small space, but when you begin stacking the odds against yourself with rooms that weren’t acoustically designed or treated, outside noise, chatter amongst guests, and you can quickly see why a portable PA system is a sound investment for anyone thinking about joining the circuit. In addition, it lends an air of professionalism if you are able to provide a quality sonic experience; word of mouth is very important in future bookings and recommendations in the house concert and coffeehouse communities. A portable PA system enables even the most intimate gigs to be more flexible by providing additional inputs for things like guitars (via Hi-Z ¼” jacks), small keyboards or synths, vocals and backing tracks. Don’t just think of what your current solo show might look like: future-proof it. Running all of your music through the PA enables you to fine-tune the mix, even if the instrumentation at smaller gigs is sparse. This can make all the difference in the world. An audience struggling to hear vocals over your acoustic guitar strumming or synth pads will be less likely to recommend you to friends, buy merch, or see you again in a more traditional, larger ticketed venue. Even if you’re hitting the stage (so to speak) as a solo act, there’s no reason you can’t bring some backing tracks with you to round out the accompaniment. Some might frown on this, but we don’t see the big deal. A portable PA will often include line-level stereo inputs for traditional stereo devices (if you’re using old school CDs) and models like our STAGEPAS 400BT have on-board Bluetooth integration, so you can stream backing tracks right from your phone or tablet during the set. Just because you’ve booked a small, solo gig doesn’t mean the sound has to be dry. We really appreciate the musical, digital reverb options available in the STAGEPAS lineup. Adding a touch of reverb to vocals in a room that offers no natural reverb is an easy way to tastefully “thicken” the sound without a lot of fuss. In fact, the digital reverb functionality included with the STAGEPAS portable PA lineup gives you the ability to change the type of reverb with one simple knob. A pro tip There’s a footswitch input on all the STAGEPAS models to mute the effect. Perfect for when you want to talk between songs, or make announcements. So far, we’ve been focusing primarily on acoustic solo artists in small settings. But house concerts don’t just have to be singer/songwriter-oriented. Similar rules apply to DJ’s spinning records at house parties, as well. With a portable PA system like STAGEPAS, you get all the inputs you need for your mixer, phono-to-line-level preamps, and subwoofer outputs for extended bass. The biggest hurdle when it comes to taming sound at house concerts is eliminating feedback (or more accurately, feedback loops) with your portable PA system. Feedback loops occur when sound is processed through your mixer, into the amplifier and to the PA speakers, then “fed back” and picked up by a microphone positioned in front of these speakers. Even in small rooms, you can take simple steps to avoid this issue. Eyes front, speakers front. This is a simple motto that’s meant to impart one simple piece of wisdom into your brain during setup: keep the speakers well in front of your vocal microphone. Position PA speakers further forward, towards your audience, than your vocal mic, and you cut the risk of creating a feedback loop in the first place. This might be tough in someone’s living room or a cramped coffee house, but make it work the best you can. It’s your first line of defense. Kill the monitors. For small gigs like this, a portable PA system is all you really need. That said, we’ve seen performers set up wedge monitors at small gigs, which can also be a contributing factor to feedback in tight spaces. Kill the wedges (they’re likely overkill anyway) and try in-ears instead (or simply no monitoring if the space is truly small enough). Use a directional mic. Simple as it sounds, this can help is improving gain before feedback occurs, in many live situations. Rat tails are gross, get them away from you! An oldie but goodie, imagine the XLR cable coming from your mic as the tail of a rat. If the rat tail is pointed away from you, the mic is picking up your voice and you run a far lower risk of positioning the capsule directly in front of the loudspeakers by accident. Lead singers who frequently move into the crowd and “point the mic” for the audience to sing often get hit with bursts of ear-splitting feedback because they had the “rat tail” pointing back at themselves, while they were right in front of the venue’s sound system, thus enabling a feedback loop to take hold and annoy anyone in a 100-meter radius. Know your space. In a house concert setting, you’ll likely be running your own mixing board (which, due to space issues, will probably be easily accessible). Real pros will learn over time which frequencies and ranges of frequencies are the problem children of the night, and will be able to easily adjust EQ settings on-the-fly to alleviate feedback problems, and get on with the show. Drop that offending frequency a few dB and you’re oftentimes good to go. Many artists carry cheat-sheets with them in their guitar cases, which describe the sound of the feedback, and instruct which frequencies dip with the EQ controls. Having said all that, Yamaha has made feedback suppression even easier in the STAGEPAS line, with the aptly titled “Feedback Suppressor” found on the unit’s compact mixer. To engage this function, simply depress one button near the master volume, and even if you’ve formed the perfect storm for feedback to occur, the system’s circuitry manages to somehow keep it in check, ensuring a clean and clear performance without the headaches. Probably our favorite feature of the STAGEPAS portable PA, and one we’ve never turned off in our weeks of testing the unit. If you’ve taken all the advice above, AND engaged the feedback suppressor (assuming you’re using a STAGEPAS portable PA, that is), you’ve probably eliminated 95% of all possible problems for small house concerts and non-traditional venues. The last item to take care of is that acoustic guitar. For intimate settings, we recommend going direct into the mixer (and not un-amplified), for a few reasons. For starters, traveling on the house concert circuit usually means you’re traveling light. So, ditch the DI box and extra cables and make use of the instrument inputs on the STAGEPAS’ mixer. Not only does it mean one less piece of gear to bring along, but fewer cables means a cleaner signal (and fewer tangles during load-out). And from a mix standpoint, you don’t want the acoustic guitar to dominate the room. So even though it might sound counter-intuitive, you can run the guitar through the PA with your vocals, balance out the mix on the board, and that way you’ve ensured the vocals aren’t struggling to compete even though you’ve actually made the guitar louder than it would have been unamplified. Plus, you now have the added benefit of being able to add fx like reverb to the guitar to give a bit more depth to what may have been a very dry sound. Pro tip: mix the guitar just loud enough so that in the room, your audience is really only hearing the acoustic come through the speakers, and not the guitar’s soundhole. If you’ve ever suffered through awful YouTube guitar videos, you know one of the more annoying things is hearing both the guitar’s strings through the camera mic, as well as the “dirty” sound coming from the amp. Many times in these videos, the amp is quieter (or simply too far away) than the actual guitar itself. Similar rules apply in a live setting; it can be a bit disorienting to be hearing the guitar’s natural sound hitting you a fraction of a second out of time with the guitar coming through the speakers (even with the best low-latency systems), and it can just sound “off” if the balance isn’t right. Don’t engage in aural confusion with your audience! Lastly, you’ll note that we haven’t mentioned miking the guitar’s sound hole and running that signal to the mixer. For good reason. We are trying to eliminate feedback, after all, and the mic-to-soundhole gambit has been the cause of countless squeals for decades at coffeehouses all across the world. With today’s mixers offering Hi-Z inputs, there’s really no practical reason to lug around extra mics and XLR cables to house concerts or other intimate performances, and sit there fiddling with the setup for any more time than is necessary to get the right mic placement on the guitar so it won’t feed back. Lose the mics, lose the DI boxes and go straight into the mixer. For these types of gigs, it’s a no-brainer. 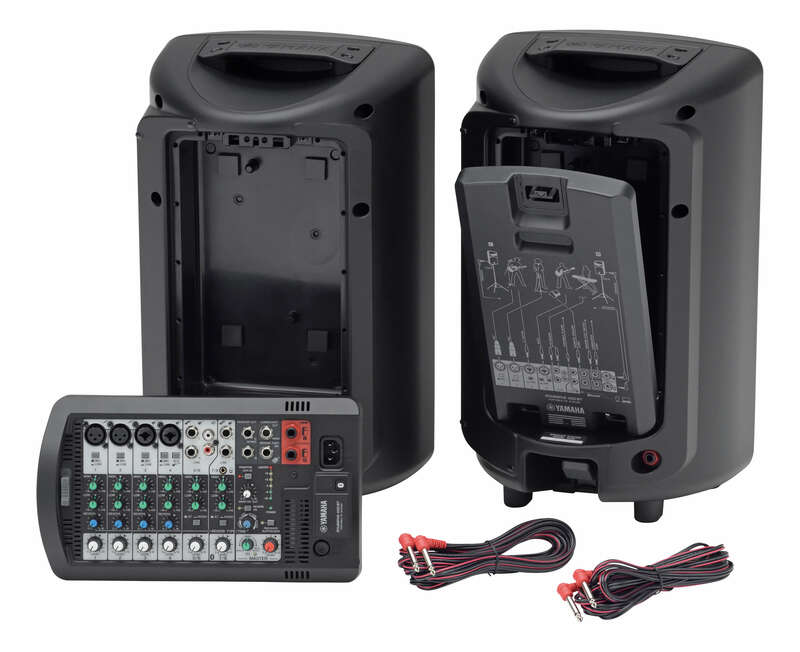 Now, keep in mind these are just meant to be some basic tips to make sure your portable PA is running feedback-free and mixes appropriately for house concerts and other non-traditional venues. Head to https://usa.yamaha.com/products/proaudio/index.html to learn more and to find the portable PA products and accessories that will fit YOUR band’s needs. Stay tuned for the final part of the series, where we’ll offer more advanced tips for live mixing with a portable PA system. Until then, be sure to check out the entire range of Yamaha Professional sound products here and follow Yamaha Music USA on Facebook and Twitter. CLICK HERE FOR PART ONE: What is the Best Portable PA System For Your Band? Do you need the wedge monitors for a pub/restaurant sized gig for a vocal and acoustic performance? if it’s a very small space, probably not, to be honest. Read our recommendations for alternatives in the article above.